The Ragdoll is a very laid back cat. The ideal Ragdoll is a well balanced cat with no extreme features. They are a medium to large, moderately longhaired, blue-eyed pointed cat. The point markings may be covered by a range of white overlay patterns. 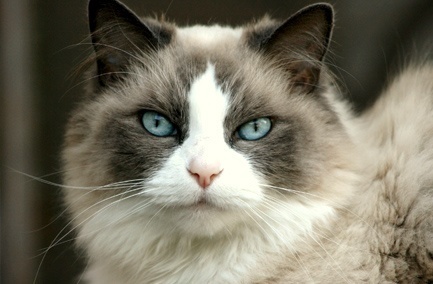 Ragdolls are slow maturing, reaching full coat and color at about three years of age. Coat colours: Seal Point and White, Lilac Point and White, Blue Point and White, Chocolate and White, Red, Cream, Torti and Lynx Colours. These large, beautiful cats are docile and love people, making them a very popular breed. Cardiomyopathy is more common in ragdolls and genetic tests are available to the conscientious breeder.